A Datomic system can grow to meet the needs of your applications with query groups. Query groups provide one or more applications in a system with independent, elastically scalable query resources and working set caches. 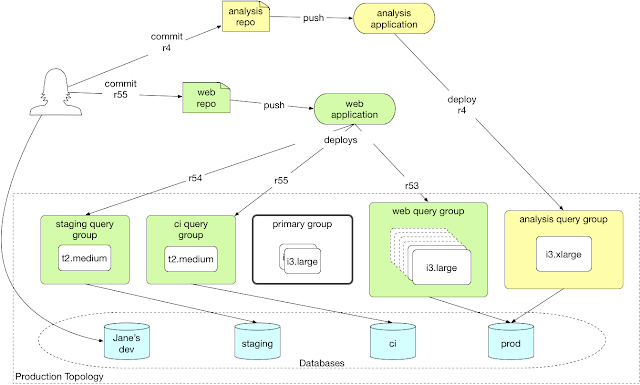 You can deploy different Datomic Ion applications to different query groups. Query groups can host different application development stages, each running their own revision of an Ion application. To learn more about query groups, read the new Planning Your System documentation. Today's Datomic Cloud release provides an easy way to parameterize ion applications. Configuration values have a lifecycle that is independent of application source code. They should not be hard-coded in the application, and should be managed separately from source code. Applications need a way to obtain their configuration values at runtime. Configuration values may be sensitive, and should not be stored or conveyed as plaintext. Parameters are a solution to these challenges. Sign up for Datomic on the AWS Marketplace. Learn more about ions from this short video. Read the new Ion Parameters documentation. The new datomic.ion.cast library lets your application produce monitoring data that are integrated with Datomic's support for AWS CloudWatch. 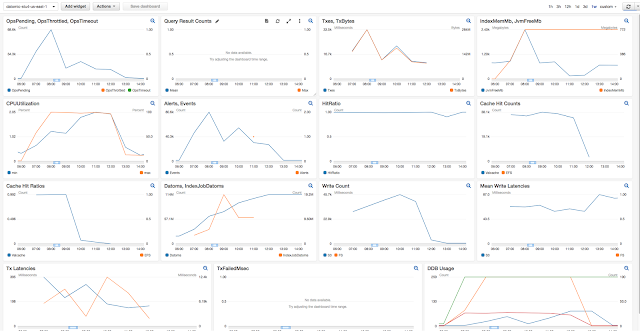 Collect and track CloudWatch Metrics -- variables that measure the behavior of your system. Configure CloudWatch Alarms to notify operations or take other automated steps when potential problems arise. Monitor, store, and search CloudWatch Logs across all your AWS resources. 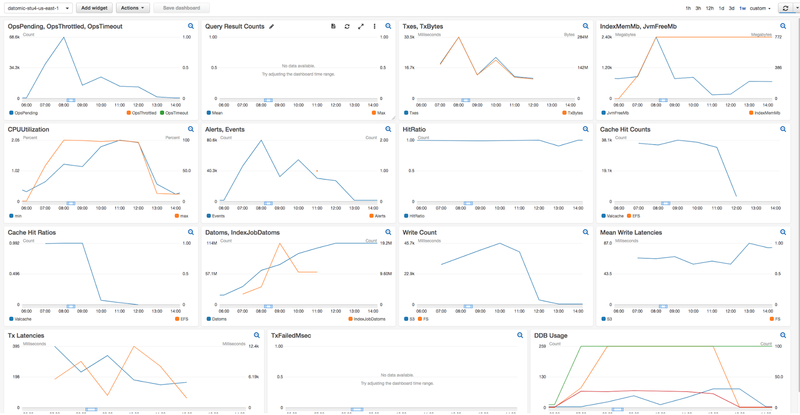 Create CloudWatch Dashboards that provide a single overview for monitoring your systems. An event is an ordinary occurence that is of interest to an operator, such as start and stop events for a process or activity. An alert is an extraordinary occurrence that requires operator intervention, such as the failure of some important process. Dev is information of interest only to developers, e.g. fine-grained logging to troubleshoot a problem during development. Dev data can be much higher volume than events or alerts. A metric is a numeric value in a named time series, such as the latency for an operation. Datomic Ions let you develop applications for the cloud by deploying your code to a running Datomic cluster. You can focus on your application logic, writing ordinary Clojure functions, and the ion tooling and infrastructure handles the deployment and execution details. You can leverage your code both inside Datomic transactions and queries, and from the world at large via built-in support for AWS Lambda. To learn more about ions, check out the Datomic Cloud Ions documentation. For Datomic On-Prem, we have added classpath functions and auto-require support for transaction functions and query expressions. Release 0.9.5697 fixes two security vulnerabilities in Datomic On-Prem transactors running the free: or dev: storage protocol. For more information, see the release announcement. The Datomic team would like to thank Caio Vargas, Matheus Bernardes, and Nubank for reporting this issue. Every Datomic permission has a hierarchical name. For example, read-only access to database Jan is named access/dbs/db/Jan/read. Permission names have a 1-1 correspondence with keys in the Datomic system S3 bucket. The Datomic client signs requests using AWS's Signature Version 4. But instead of using your IAM credentials directly, the Datomic client uses your IAM credentials to retrieve a signing key from S3. Thus, IAM read permissions of S3 paths act as proxies for Datomic permissions. As a result, you can use all of the ordinary IAM tools (roles, groups, users, policies, etc.) to authorize use of Datomic. After decades of experience with racing to log into new servers to change the admin password, we think that this "secure by default" is pretty cool. But that is not the end of the story, as clients also must have network-level access to Datomic. Each of these approaches has its place for application access, and I will say more about them in a future article. For easy access to Datomic from a developer's laptop we offer the bastion. 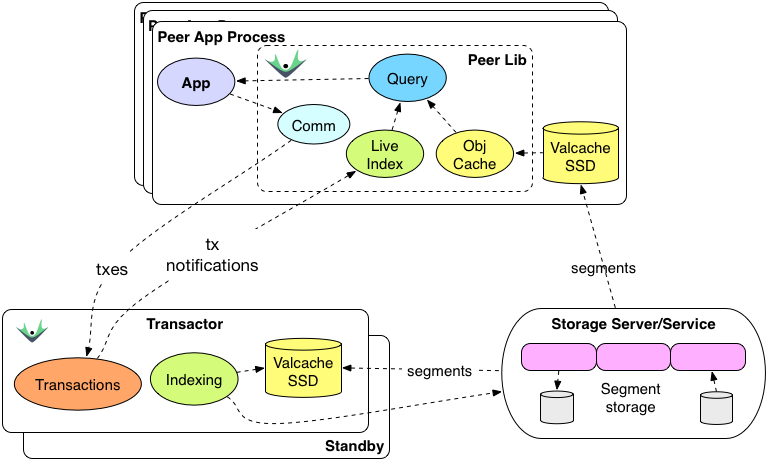 The bastion is a dedicated machine with one job only: to enable developer access to Datomic. When you turn the bastion on, you get a barebones AWS Linux instance that does exactly one thing: forwards SSH traffic to your Datomic system. Access to the bastion is secured using the same IAM + S3 proxying technique used earlier for auth. The bastion has an auto-generated, ephemeral private key that is stored in S3 and secured by IAM. The bastion is dynamic, and you can turn it on or off an any time. And the client support means that the bastion is entirely transparent to your code, which differs only in the argument used to create the client. Our 'ci' system is dedicated to continuous integration, supporting several dozen Jenkins projects. The ci system contains no sensitive data, only canned and generated examples. The ci system runs the Solo Topology with the bastion enabled to allow access by automated tests. Our 'devdata' system contains non-sensitive data used by the development team (think departmental and sample apps). The devdata system runs the Solo Topology with the bastion enabled to allow access by developers. Our 'applications' system supports applications and contains real-world data. The applications system is reachable only by deployed application code, and needs to be highly available. So the applications system uses the Production Topology with the bastion disabled, and also uses fine-grained IAM permissions to limit applications to the databases they need. Datomic is secure by default, integrating directly with AWS IAM and VPC capabilities. The bastion makes it easy for developers to get connected, so you can be up and transacting on a new system in minutes. Or just dive in and get started.